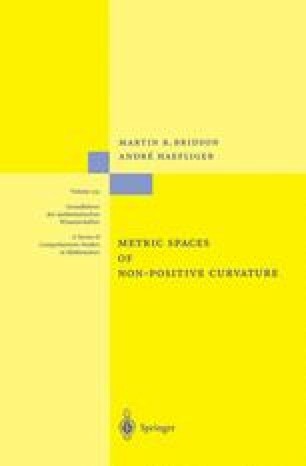 In this chapter we study group actions on metric and topological spaces. Following some general remarks, we shall describe how to construct a group presentation for an arbitrary group Γ acting by homeomorphisms on a simply connected topological space X. If X is a simply connected length space and Γ is acting properly and cocompactly by isometries, then this construction gives a finite presentation for Γ. In order to obtain a more satisfactory description of the relationship between a length space and any group which acts properly and cocompactly by isometries on it, one should regard the group itself as a metric object; in the second part of this chapter we shall explore this idea. The key notion in this regard is quasi-isometry, an equivalence relation among metric spaces that equates spaces which look the same on the large scale (8.14).